‘Welcome to the Green Heart of Trentino’, reads the sign as you enter the Vanoi valley, which is cut in two by the stream bearing the same name. The valley has just one town – Canal San Bovo – plus a host of small villages dotted along the mountain slopes, in a stretch running into the Lagorai mountain chain which separates it from the neighbouring Val di Fiemme: an area which is a paradise for its waters, woodlands and its immense natural greenery. Access to the Vanoi is through a tunnel about four kilometers long under Monte Totoga, and so the valley is somehow eclosed by the solidity of its mountains, almost as if to protect a way of life that was once one of isolation, and a challenge to human resilience. The trip down the tunnel from the Primiero to Vanoi (of which the valley is part), although short, is full of surprises: to begin with, the two valleys have different microclimates, so sometimes it is raining on one side, while the sun is shining on the other. The valley is also occupied by the Vanoi Ecomuseum, an open-air initiative whose goal is to preserve and value the heritage of the area. Like the hospitality provided by an amenable host who offers you everything he has, or looking at the intimate photos of a family album, turning the pages of a history book dedicated to the Vanoi is a privilege. Photos, in fact, are like the history books of people, and the Vanoi Ecomuseum – whose symbol is a rose with four petals – does just that, as it is not made by colourful but fake characters, but it presents the stories of real people (below, see an image of the Vanoi Ecomuseum's headquarters in Canal San Bovo). In fact, the Vanoi Ecomuseum is like a community family album looking after the individuation, knowledge and transmission of the cultural heritage that spreads over the whole valley, with the goal of mapping and preserving the signs of its history – as well as the material and immaterial culture that have characterized this secluded Alpine location over the centuries up to now. Created in 1999 within the wider context of the Natural Park Paneveggio – Pale di San Martino, and officially recognized by the Autonomous Province of Trento, the Vanoi Ecomuseum has as its main goal a long-term program of activities. It is also part of a network that comprises, in all, seven Ecomuseums within Trentino, the closest of which is neighbouring Lagorai. Over the centuries, the people of Vanoi have lived on a land rich in natural underground resources, hydroelectric power and timber, and yet only one resource – which is everywhere but is easily overlooked – has been freely available to all on a regular basis: grass. The history of this valley is then largely a story of grass, as for many centuries grass has been the main means of survival in the Vanoi valley; meadows were also the destination of seasonal pilgrimages from the valley floor up to the mountain slopes and, higher still, to the high altitude diaries ('malghe'). Farming Alpine valleys has always been a question of moving up and down steep gradients, threshing and ploughing in the toughest possible conditions: the valleys, meadows and dairies – and so life went on at three different altitudes, without even being able to stay put at any one height. At home in Caoria, Zortea, Ronco, Canale, Prade, Gobbera or Cicona – villages consisting of not much more than a church, school and cemetery: this is where winters were spent, about a thousand metres below the dairies, where cows pastured during the summer. In June, dawn broke at five o’clock, and the meadows needed thrashing for hay, while wheat, onions, beans and potatoes needed harvesting; flax and hemp needed sowing. In Greenland, as we know, there are more than ten words for ‘snow’; in the same way, in the Vanoi valley there are as many words to describe grass: ‘thin’, ‘stringy’, ‘light’, ‘round’, ‘empty’, ‘tall’, ‘bad’, ‘stinging’, ‘poisonous’; ‘dry grass’, ‘meadow grass’, ‘dairy grass’, ‘medicinal grass’ and ‘disinfectant grass’. Then, there are even those words which cannot be translated literally, but need a longer description: ‘grass for milk and for meat’; ‘poor quality grass like the hair of a donkey’; ‘grass for calves, as smooth as chocolate for children’ – and also: ‘slippery grass’; ‘tough grass for threshing’; ‘grass that makes the goats drunk’; ‘grass with a yellow liquid that blisters the hands’ and ‘grass to calm a newborn baby’. Today there is also an Ethnographic trail, which reproduces the continuous ‘to-ing and fro-ing’ of people from the Vanoi valley bottom – between Caoria (at 846 metres above sea level) and the dairy at Malga Vesnota de Sora (at 1,876 metres). The trail has both historic and current value, as it is still being used. It is also part of a European scale project promoted and created by the Paneveggio – Pale di San Martino Nature Reserve, the Museum of Uses and Customs of the Peoples of Trentino in San Michele all’Adige and the local authority in Canal San Bovo, for the purpose of safeguarding and disseminating the historic and cultural heritage of the Vanoi by means of a network of pathways and itineraries including the four thematic trails listed below – each dedicated to one type of natural element. The Ethnographic trail created in the Vanoi is a perfect way to learn about the heritage of the valley, which stems from a human history handed down by word of mouth rather than written in books. The trail stretches the length and width of the territory, which covers an area of about 4,000 hectares (10,000 acres) to the south of the Lagorai mountain range, between the Valsorda and Valzanca. If you walk along the trail, you will see much of the area and understand a great deal about how it has come to be the way it is today. For example, at the end of winter, in February, people moved up to the meadows: men, women and children left the villages and drove cows, goats and pigs up the slopes carrying hoes, scythes, rakes, blankets, pots and pans, and shooing hens and rabbits along the way. Families often had eight or nine members, each of whom carried something up to the grazing lands. The journey was necessary in order to reach the green pastures that provided the first step in an indispensable food chain, which started with grazing the fields. The end products of this food chain were milk, cheese and meat. The winter-end move to the pastures was only one of the many journeys undertaken during the year: almost every day someone had to return to the valley bottom and climb back up to the meadows in the evening. On Sunday the whole family returned to the village for the church service; the church bells were sometimes also used to warn the community of danger – often in the form of heavy rainfall or flooding. On those occasions, everything that could be taken out of the house was moved up the mountain side into safety. In Pradi de Tognola there is also a special calendar, called the ‘Cylinder of Time’; it is a record of the annual walks of the inhabitants of Vanoi over a year: an average of 35 km were walked by every man, 11 by every woman and 15 by every boy. The Ecomuseum has a number of other cylinders showing also all Saints’ days, pageants, sowing times, pasturing and threshing times. The Vanoi would not be so green if it did not have so much water – a precious source of energy. The torrent and its tributaries were used to transport goods before the troops during WW1, who used the timber to build the most important roads in the valley. Water, though, is not something that can be controlled: it can be used, forced into canals, tapped – but, unlike grass, people in the valley considered it hostile: a danger due to the frequent flooding (there have been 16 damaging floods since the year 1000 – the most recent one in 1966). This danger has had the effect of producing ‘vertical’ villages – none are on the valley floor except Caoria – and a dedicated transport system, which reaches upwards into safety. In the 19th century the population of Vanoi was of about 11,000, and grass was not a livelihood that could feed everyone; at that time, rich outsiders had already laid their hands on the most precious resources of the valley: hydroelectric energy, timber and minerals. The conifers in the woodlands were cut for timber and already used at the time of the Venetian Republic (the ‘Serenissima’), whilst lead, copper and zinc were plundered on both sides of the valley for decades by the Austro-Hungarian Empire; the money went elsewhere, but the labour came from (and to) Vanoi. After the grazing era came the mines, with German and Czech miners imported into the area. But even before that, for seven hundred years, the timber industry had employed local farmers, forcing them to take extra work for low pay in the spruce forests above the meadows. Seven kilometers along the woodland trail that crosses the Valsorda forest – which was created in 1557 by the Austrian-Hungarian Emperor Ferdinand 1st – you can see a complex economic system including the Siega, the Venetian timber works of Valzanca and the timber slide of Valsorda (by the Medaluna quarry), as well as the area of Pian de la Siega – once used to cut down trees for timber (timber mills were once a very common sight in Trentino, and were powered by water wheels). Along the way, you may still meet some lumberjacks at work with saws, or see bare trunks being transported by overhead cable. The woodland trail just shows how hard life was in the timber trade: the rivers were swollen by the melting ice and were used by lumberjacks (‘menadori’) to transport the trunks to the valley bottom with the help of ropes and poles equipped with hooks and picks. It was hard, often hazardous work, and a drop of grappa or a smoke of tobacco grown near home helped to alleviate the hardship of labour, which often involved swimming in the torrents to free the trunks. Many workmen actually drowned, and after such incidents the community often questioned the safety and wisdom of the timber trade, which enriched merchants abroad and provided beautiful furniture for the homes of city people who had never actually seen a woodland or heard of a lumberjack drowning, as these incidents were all too often forgotten outside the local community. The wood left over as a byproduct of the timber industry was then used by the community to fashion farming equipment, roofs made of shingle, or for engravings and wood carvings done by the menfolk at home – especially in winter – as the women worked with nimble fingers on the spinning machines while children listened to stories by the fireside. The ancient art of woodwork in the Vanoi has now also been made famous by cinema: ‘L’ultimo restelèr del Vanoi’ ("The last rake-maker of Vanoi") was awarded a special prize at the Trento Mountain Film Festival – a yearly international event. Craftsman Pietro Zortea – the man portrayed in the documentary – lives and works in Berni (one of the hamlets of Vanoi), and he still makes wooden rakes and other tools used for traditional Alpine farming. ‘Scandole’ (wooden roof tiles) were instead used in farmhouses, and the film is also dedicated to this product; the making of the scandole was filmed in Casoi della Fiamena, and it shows each stage of the process involved in manufacturing the tiles. Today, in Caoria, two buildings are used as the site for the WW1 Museum, run by the local Alpine troops in conjunction with the Museums of Arts and Crafts, always based in Caoria. The sites illustrate two opposing activities – one destructive and infliced on the population, the other constructive and entirely voluntary; in both buildings, the renovation of the cellars, floors, barns and other structures was surprisingly accurate, as many local inhabitants remembered precisely how the buildings looked like when they were built. In the Vanoi valley, WW1 took nearly all men over 21 and sent them to fight in Galicia; those who did not fight – the elderly, women and children – were moved elsewhere, as the entire area became a ferocious theatre of war. Ordinary activities were interrupted; houses and diaries were abandoned, as the armies faced each other on the different sides of the mountain – the Italian and the Austo-Hungarian – engaging in a deadly slow-motion battle in the snow, without roads or any other facilities, which ended up leaving behind 10,000 dead. The 20,000 objects in the Caoria Museum dedicated to WW1 are the remains of a huge human tragedy – uniforms, weapons, field equipment, photos, writings, down to the closest details: a pair of boots, abandoned food-tins, a piece of barbed wire. One item in particular – a small piece of metal that looks like a pebble – bears the words: ‘Shrapnel from a bomb which exploded on 14th May 1918 and which was lodged in my right lung for 36 years. Domenica Loss’. Loss – in fact, a typical name from the Vanoi area – can also be seen appearing in the Arts and Crafts Museum, next to pieces of household and other farming equipment, such as an outstanding old pedal frame that is still in perfect working conditions. The War Museum also contains many letters written by soldiers; many are particularly touching and never actually reached their destination. The 13th Regiment was posted to the trenches at the foot of the Busa Alta in 1916; the letters that the soldiers wrote from there were found in a loft in Caoria only 70 years later. And if it were not for the huge stone-cross at the entrance, the Caoria cemetery – built in 1916 – would look more like a garden full of flowers. To highlight the proposals of the Vanoi Ecomuseum, a decorative rosette with four petals has been chosen as a symbol: a logo which can be seen on maps and the calendar of activities, and that will follow the visitor on the signs along the itineraries. Everywhere it appears, the rosette is a reminder of the collective effort made in order to acknowledge and appreciate the heritage of the Vanoi valley. The Ecomuseum offers a key to read the landscape transversally thought time, and with that goal in mind, it uses seven illustrated themes as its main device. For each of these seven themes – first of all water, which has been chosen as the main characteristic of the valley (see below) – you will see along the route of your visit buildings or sites where to find information and thematic set-ups: these are elements that represent the themes, and the trails that are dedicated to them. It is important to remember that these trails and paths are still used and crossed by the people who live here today; it is therefore recommended to visit with a discreet and gentle approach, without leaving traces, and with the due respect and attention. The invitation is get to know this landscape with eyes and heart wide open; in this way, it will reveal its story. The maps produced are the global representation of the territory of the Ecomuseum, with all that is visible and the themed trails within it. These are handy and agile instruments, which can be found by the info points or at the Ecomuseum House in Caoria, as well as at the Ecomuseum’s headquarters in Canal San Bovo. The maps can be used together with a dedicated publication for the Ethnographic path and the so-called itineraries “of the Water” and “of the Sacred”, which are easy walking circular trails, both starting by the headquarters' building in Canal San Bovo. In Canal San Bovo there is an interesting circular trail dedicated to water. Collectively called the ‘river park’, it is an easy walk designed to give the visitor precious information on the history, environment and uses of the local people around the theme of water. The route circles the whole community with a total length of 3,2 km and it can be easily walked by everybody, in most seasons. Along the trail are located 15 boards that recall the attention of the visitor on the relationship man-nature in past and current times. The visitor is accompanied along the path by blue signs bearing the Ecomuseum’s logo. The beginning of the trail is by the Ecomuseum’s headquarters, where there is a first board that will orient the walker. The walk develops further almost totally on pre-existing tracks, apart from a small section created on purpose. From the little square in front of the Ecomuseum the trail first takes a downhill SW-direction until reaching the Lozen stream; after that, the confluence with the Vanoi stream is gained. From there, one continues on flat ground in a NE-direction, following the length of the stream and then entering into a woodland patch. Past a staircase that takes in the proximity of the industrial area, the only slightly steep section follows; even though quite short, it is nevertheless characterized by a steep rise. At the end of this section, one goes back into the inhabited area, and – after stopping at a few further points with information boards – the initial starting point of the route is eventually reached through the higher part of the village. The four sections that follow (the valley, the meadow, the mountain and the woodland) are as many parts of the seven themes mentioned above. These are all sections of the extensive Ethnographic path that centers around the village of Caoria (see below), which it is advised to visit first. Although these sections form together a unified whole, they will tend, more often than not, to be walked individually – especially considering the fact that each of the themes lends itself to be expanded and investigated further, and that there are also seasonal restrictions to the paths, especially in winter. In fact, as the first two set of paths (the valley and the meadow) can potentially be taken in all seasons (even in winter, weather permitting), the two higher sets (the mountain and the woodland) will normally be walked in the good season only, once the risk of snow and ice have abated. For centuries, the valley (‘la val’ in the local patois) represented the starting point of the upward movement of people and animals to the higher parts of the mountain. Today, this is also the starting point of the Ethnographic path, where you can establish your first direct contact with the way of life and real culture of this community. The resources of the territory around the village of Caoria (see below) – timber, hay and minerals – have been exploited by non-resident landowners since around 1300, but the first reliable evidence of a settlement is a crucifix that was painted on a house in the hamlet of Losi in 1585. Over the following three centuries, Caoria has continued to grow despite the fact that it was physically divided into the two districts of ‘de dentre’ (inner) and ‘de fora’ (outer). The houses were built in family clusters – known as ‘colonei’ – and that organization can still be seen today. If you happen to visit the village in summer, picture yourself that only fifty years ago you would have seen hardly anybody about, as all the villagers would have been working on the higher meadows or on the mountain pastures, either haymaking or taking the animals to graze! As an additional piece of information, I recommend you take this route after a visit to the Ethnographic Path Center (open summer only); then, start the trail by the wooden bridge over the Valsorda stream, where the two circular routes join – best is to visit Caoria ‘de fora’ first, and then Caoria ‘de dentre’. The map bears some significant information to help one understand the environment of the ‘val’ – what it was like once and how it appears today. Additional information with distances, times, regulations and other technical details concerning the circular walk can be found along the route. The lower meadows are the space where cattle used to graze in spring before going up to the high alpine summer pastures, and then again in autumn upon their descent. Haymaking was mainly done at this level, together with some basic agriculture, the product of which was integrated with the meager resources of the valley (‘la val’ – see above). In no time at all we can see at the beginning of the path the meadows above Caoria; they extend up to the long established productive woods at about 1,400 meters of altitude (a band known as “bosconero” – ‘dark wood’). The slopes of the Valsorda and Valzanca valleys were systematically deforested since the beginning of the 18th century; this deforestation safeguarded the community’s special way of life, which was based on optimizing the few resources available through a system of people being constantly on the move ‘vertically’. As you walk through the ‘pradi’ or meadowlands today, just imagine them not being suffocated by shrubs, but being regularly scythed by men, raked by women and children, with plenty of barns full of hay and small patches planted along with blue flax flowers. The recommended route is to visit the exhibit at Prà de Madègo first, and then to continue on from the ‘Pont de Stel’ bridge. This area marks an important location at the confluence between river and road – at a junction where we find an old inn along the two slopes of the Valsorda. The map highlights some significant features to help one understand the ‘pradi’ environment – what they were like once, and how they are today. Again, additional information with distances, times, regulations and other technical details concerning the circular walk can be found along the route. The mountain is the place where high Alpine summer pastures have become a natural resource for the people of Caoria since Medieval times. The vertical organization of grazing lands (known as ‘campigoli’) at different levels, and the movement from one pasture to another from June through to September, resulted in an optimal use of these rich meadows. Horizontal movements within each pasture assured the best possible use of grass over more than one day, whilst at the same time protecting the slopes against erosion. The mountain circular route follows the tracks that cattle herds climbed up and down the slopes, stopping at those same places where the animals grazed over the summer months, and where mountain farmers used to make butter and cheese from milk. We may still come across cattle grazing on high summer pastures, but cheese is no longer made there, as milk is brought down to be worked in the valley. It is recommended to take the route that starts from the ‘malga’/pasture of Piani di Valzanca, and it is advised to join this trail after having walked one of the other routes (the two above) first. There are maps displaying important information to help one understand the mountain environment and the other features that are met along the way – what they were like once, and how they are today. Additional information with distances, times, regulations and other technical details concerning the circular walk can be found along the route. The woodlands – today as in past years – are made up of conifers that grow from above the meadows up to the tree line, where the landscape opens up onto high alpine pastures. Timber coming from local woods has represented the main economic resource in the area for centuries, and in fact it still does today. Woodlands were a place of constant movement in all directions for men with their vehicles and tools – and for timber too, which would only travel downwards. The circular woodland trail penetrates deep into the extensive provincial forest of Valsorda. This forest – in the valley bearing the same name – was established in 1557 by the Austrian Hungarian Emperor Ferdinand I, and one can still see here the man-made equipment that was used for tree felling up to the late 1900s. One may still come upon a lumberjack busy felling trees with a power saw, or transporting logs via a haulage cableway. The Valzanca sawmill, which operated until 1954, is now working for educational purposes only. It is recommended, along the route, to take particular notice of two features, both concerned with forestry techniques: the permanent exhibit of the slideway known as ‘Medaluna’ and the area known as Pian de la Siega (the “wood-sawing plain”). The map that can be picked up from the info points or at the Ecomuseum House bears some significant information to help one understand the woodland environment – what it was like once, and how it is today. Additional information regarding distances, times, regulations and other technical details concerning the circular walk can be found along the route. There is also an interesting circular trail dedicated to te theme of the sacred. The inhabitants of the Vanoi have left a great deal of evidence of their sense of the sacred and the divine along the pathways that took them from the valley floor to the woods and meadows, and higher up still into the mountains: thousands of examples of engravings on wood, plaster, stone and on the façades – not to mention frescoes, capitals, crucifixes, niches and improvised altars along the roadsides. These spontaneous works of art can sometimes also be found in the woodland and along the paths, by river banks and in caves. They served as stopping points during processions or simply as temporary places of prayer, and are usually in a good state of repair. In some cases, they were erected as thanksgiving after a natural disaster or danger that had passed by without harm. There is such an immense quantity of material – some more sacred in nature, some more profane: in Canal San Bovo, close to the hamlet of Danoli, there is a capital with iron grating; at first sight, the grate hides the face of Christ, but in fact the face can be seen only if you bend (or kneel) down; only then will you notice that it has bright blue eyes, wide open. The people of Vanoi have always felt a need for the sacred; many objects have been renovated and are preserved by the local inhabitants today, so there is still plenty of evidence of religious devotion in the area. Many of these spontaneous works of art were carried out by traveling craftsmen (clòmeri; frescanti), who came and went during the Renaissance period, often bringing religious artifacts (or even catalogues of items) with them (below, see an image of a popular art fresco along the streets of Canal San Bovo). Generally these craftsmen were on foot; some sang songs and rhymes in dialect listing their wares, which were kept in a wooden suitcase carried on the shoulders. One of such singing rhymes, for instance, went like this: “Làpis e matite/botòi tondi par giachéte quadre/Saonéte che sa de bon odor/Carta ròsa par scriver a la morosa/Guce de tute le sòrt, de lunghe e de curte, par cusir/Pèteni e petenìne/Dedai/Metri par falegnami e àstici par mudande” (a rough translation would be: ‘Pencils, round buttons for chequered jackets, sweet-smelling soap, pink paper to write to your loved one, needles to sew, combs and brushes, tape measures, ribbing for corsets'). The goods also included rosaries, reproductions of saints and of the Virgin Mary, prayer books, crucifixes, medals, decorations for altars and capitals, and so on – religious items that did not need advertising. Some of these works can now be found and seen in the so-called ‘Stanza del Sacro’ (the ‘Sacred Room’) in Zortea, a village where the particular design of the façade windows – in three parts – is derived from the Venetian architecture. The ‘Sacred Room’ is also an important part of the Vanoi Ecomuseum, as it contains – at the entrance – a 17th century Pietà and a wooden cross with a scene from the Passion in the background (this part is 19th century). 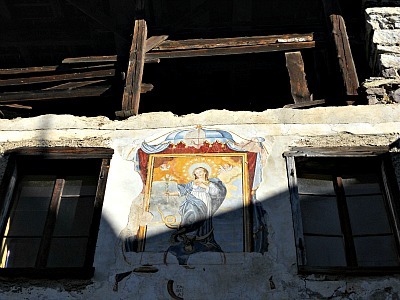 At the entrance of the hamlet of Zortea, there is also the so-called ‘Crucifix of Sunday Sins’ – all decorated with different wooden tools of daily use. 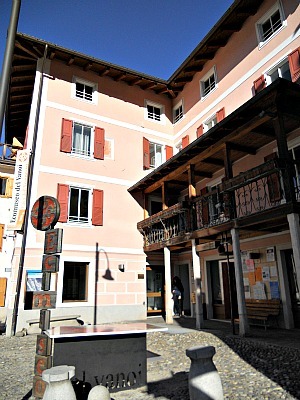 Once, on pageant days dedicated to the Patron Saint, the village squares of Trentino were used for performances, poetry recitals and so on. These pageants relieved the daily grind, and the custom of staging religious plays survives to this day – in this area – only in the hamlet of Prade, where the story of Godimondo and Fortunato has been performed every ten years for centuries. The pageant includes traditional dresses, as shown in the photographs in the ‘Sacred Room’. The audience, during this traditional performance, meets under the stage in the village square, and the murmuring is quietened only by the appearance of the first actor: an angel who recites a prologue that summarizes the story of two brothers – fun-loving Godimondo and God-fearing Fortunato, finally rewarded in Heaven for his lifelong sacrifices. As said earlier, the play is scheduled every ten years; the last time it was performed in 2008, and in case you are interested to attend it, it is better to check beforehand. Rather than by a high street, the main axis in Caoria is represented by the course of the Vanoi – and in fact, the stream was of great importance not just for the village, but for the entire valley: its waters were used as a waterway and a source of power to drive the saw and grain mills. From 1750 onwards, though, the Vanoi caused a series of damaging floods and landslides – some very dramatic – that changed the shape of the valley forever. In terms of the origins of Caoria, at the end of 1500s the first small hamlet (called Losi) was built, and its nucleus of houses was erected at the foot of Monte Fiamena, at the junction between the road to Canal San Bovo and the Busche stream. Caoria often battled with the Valsorda stream, which when in full flood also destroyed fields and houses – at times even threatening the church and cemetery. The two parts that form the village have in fact evolved on the alluvial plain of the Valsorda stream. Not only floods from the torrent led to the division of the village into two (‘inner’ and ‘outer’ are meant in relation to the stream), but the stream has also influenced the way of life – that turned more and more towards the higher, more sheltered ground of the meadows (the ‘pradi’ – see above). The houses in the village – which traditionally were being used with continuity over the winter months only – were organized over three floors: basement, living quarters and loft. After WW2, though, the types of building changed rapidly, to adapt to new ways of life. Up to the 1800s the rooms with a fire (the smoky kitchen with an open fire for cooking and the room called ‘stua’, which was heated with a simple brick stove) were the heart of a home. Separate from the house, the functional compound of stable and hay loft represented a real ‘milk machine’: hay entered through a wide door into the hay loft, and then it was dropped down through a trap door into the stable to feed the animals; the end result of this operation was pails of milk, which came out of the lower doors of the stable daily. Many of the oldest groups of houses in Caoria (called ‘colonei’) – such as those at the foot of the Fossèrnega mountain – can be traced to single family units that date back to the 1600s. The location of these hamlets provided a natural shelter from floods and landslides, but in winter the local population still had to face snow and snow slides. The old church, built in 1742, was dedicated to St. John Nepomuk, protector of water. The building was enlarged more than once and it soon became the spiritual centre of the community, where all religious functions were celebrated. In more recent times, however, the old church became structurally unstable, and a new building was erected further up the main road, at the heart of the community. In the village there are several fountains, which for centuries were an essential commodity: this is where the villagers drew water, where laundry was washed, and where animals were taken to drink; in winter, the pig would have been slaughtered there too. In the 1800s, wash houses (called ‘liscaie’ in the local patois) were built, where women did their washing. A characteristic of Caoria and the whole valley is the vertical organization of space, as since the 14th century man has woven a vast network of paths that wind their way up the mountain slopes. At the junction of some of these trails settled the small hamlets that later came to form the community, and sacred shrines were sometimes also erected (see the ‘Itinerary of the Sacred’ above). Kilometres of dry stone walls meant that the steep slopes above the villages (called ‘rive’) could be cultivated too: women and children carried earth and manure in hand barrows up to the narrow terrace ledges known as ‘vanede’. An area of beech wood above (called ‘Bosch bandì’) protected these rather infertile and man-made strips of land from the snow slides. Further down in the village, the few level areas of land between one group of houses and another were very precious: all the womenfolk kept there at least a small patch with flowers, as well as a vegetable plot (mainly cultivated with potatoes, beans, cabbages and little else). The 1914-18 war brought huge, collective suffering to the community. The village was emptied, and families were deprived of both men and animals. A trail of death left behind 800 people – a huge toll for such a small community. On their return, the living were shocked to find a plundered village, full of wood shackles and scarred by the new roads traced for military purposes. In order to keep these memories alive, today there is in Caoria a small Museum dedicated to WW1 events. As stated earlier, the Vanoi Ecomuseum is part of the Natural Park of Paneveggio ('Parco Naturale Regionale Paneveggio-Pale di San Martino'), which also contains within its boundaries the renowned Dolomite group of the Pale di San Martino. The valley also belongs to Primiero, an historical sub-region in eastern Trentino.